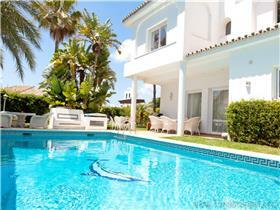 We have a wide selection of rental villas in Marbella, most of which have their own pool, Sky TV and air conditioning. If you see a villa below, click on the picture to find out more information about the villa including price and availability. Marbella is is good location when staying on holiday. It is in the middle of the Costa del Sol coastal region and hence provides a good location from where you may go exploring the coast and the many tourist locations. 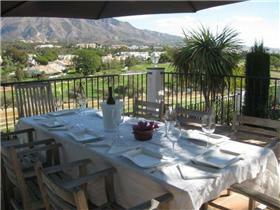 Marbella is an excellent place to stay for families. The town hall is one of the richest on the coast and as such you will notice that they are happy to spend a lot of money on the various plants and shrubs that are planted throughout the town. There are some good beaches including a good beach for young children next to Marbella Port. This particular bay is very shallow water and is very sheltered. There are a couple of cheringitos on this beach. Marbella Port has many bars and restaurants available. The nightlife is actually pretty good in the port and also in the town centre.